It’s a simple rule of business that you want to make more money than you spend. It follows that it’s important to know how much money you’re spending. Money that’s spent on convincing a customer to make a purchase is called the Customer Acquisition Cost. In order to be profitable, at the simplest level, customer acquisition cost will need to be lower than their lifetime value as a customer. You need to make more money than you spend acquiring the customer. The easiest method of calculating CAC is to add up all the expenses of acquiring a customer and divide it by the total number of new customers. 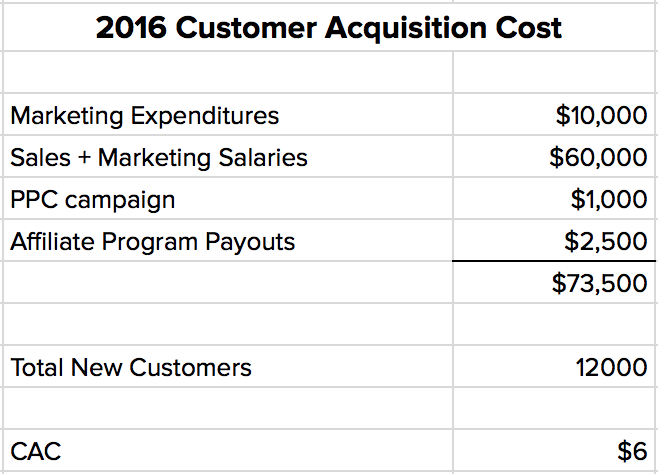 Expenses include costs at every stage of the funnel, ie. marketing salaries, PPC campaigns, sales executives, etc. In the example above, the company has a CAC of $6. Is this good? Well, it depends. If they sell enterprise software and customers typically spend thousands of dollars annually, they are doing pretty well. Investors will be extremely happy. If they sell skateboards for $20, that cost $10 to make… their return isn’t so good. Most marketers will want to know their CAC by marketing channel. This helps them understand the most cost effective way to acquire customers – and where they should be putting more effort in the future. There’s two main ways to do this – using averages, or last touch attribution. To use averages, simply break out the expenditures per channel, assume each channel contributes the same number of customers, and divide. Unfortunately, that can be a big assumption. If one channel is particularly effective, or you only turned on Twitter campaigns for a week, your CAC for that channel will be biased. Instead, most marketers will use the last touch attribution model. In this case, the channel the customer was last “touched” by before purchase is given credit for the conversion. For example – if a customer saw a Facebook ad, downloaded an ebook and then purchased through a PPC campaign on Google, we would say the customer was acquired through the PPC campaign. Most marketing software (or even Google Analytics) will track last touch conversion, making this an easy way to attribute the sale. Generally, you want to decrease your CAC because it means your profit will increase. You can do this by choosing more effective channels of acquisition, or by improving the conversion rate. However, if your CAC is very low and you’ve optimised for conversion, you might think about acquiring customers through a more expensive channel. Even though the CAC will increase, the increase in customers will more than pay off. As long as you are still making more money than you’re spending, the business is growing. CAC by itself is only a number. It only becomes important when you’re able to compare it to customer lifetime value – or the amount of revenue one customer brings in over the lifetime of their relationship with your business. You can read more about calculating LTV in this Baremetrics Academy lesson.